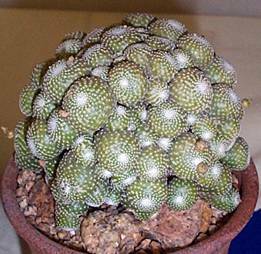 Frailea is a medium size genus of small cacti. The range of Frailea stretches from Colombia to Argentina, and overlaps that of Parodia and Notocactus. The genus is closely related to Parodia. The number of species is probably less than 50, but uncertain, with many species recently named and available only as seed from European suppliers. Many of these new species are probably redundant, and when a careful revision of the genus is published will disappear as synonyms. Frailea schlinzkyana entered in the 2001 Intercity Show by Tom Glavich. Frailea are easily grown, requiring bright light, and some protection from mid-day full sun. Any well drained potting mix will do. In habitat they can be found among rocks and in grassland, getting the same kind of broken shade that they get when grown under screen or light shade cloth. This genus is somewhat less tolerant of summer over-watering than many, with some of the more collectable species (F. asteroides) being the least tolerant. Almost all the species are weakly spined, with the pattern of the areoles on the body an important part of the plant, and often emphasized in staging for shows. The bodies are often strange blends of brown, purple and dark green. In habitat, this genus is generally short lived, with an average plant living only a few years before succumbing to predators, rot, or drought. The plants generally stay very small, from not much bigger than a nickel to an inch or two in diameter. When grown in pots, protected from predators, disease and drought, two interesting things happen. The first is that they grow to enormous size. Single heads can get as large as 3 inches, and clumping species can fill a six inch pot with remarkable speed. The second is that they lose control of their meristems. The meristem is the center of new tissue growth, normally at the center top of the plants. As they age, normally solitary species start producing pups, sometimes with great abandon. It’s not unusual to see an old plant producing a set of pups, some normal, some not. Pups are usually produced at areoles, but occasionally are produced internally to the body of the plant, eventually erupting through the side. Frailea invariably have yellow flowers. These are usually cleistogamous, which means that they pollinate themselves as buds. Frailea flower freely when warm and sunny, but even when the flowers don’t open they don’t they produce hundreds of seeds. The seeds are easily raised, germinating quickly, but are only viable a short time. Seeds collected in late summer can be planted immediately, or can be saved until spring, however after a year there will be a noticeable loss in viability. Some germination still occurs with two and three year old seed, if carefully preserved in cool, dry storage. Blossfeldia liliputana entered in the 2001 Winter Show by Laura and Gene Oster. Blossfeldia is the genus containing the smallest of the cacti. Blossfeldia liliputana, the only currently recognized species grows to only ½ inch across in habitat. The genus is native to Bolivia and Argentina, and is established over a wide geographical area. These are difficult plants to grow on their own roots. Their specialized environment (mountain rock cracks), and the extremely dry environment makes them very sensitive to root loss. Blossfeldia have many unique characteristics, the most important is their ability (in habitat) to survive nearly complete desiccation, recovering when fog, mist or rain returns to their natural environment. Frailea angelesii is a well known clumping species, growing more slowly than Frailea grahliana, below, but eventually producing small clumps of dark purple heads. Frailea asteroides is the collector’s choice. When well grown, it is often a dark brown to purple. As it ages, it tends more towards brown. Normally a single head, but with good growing conditions, and attention to watering, specimens like that shown above can be produced. 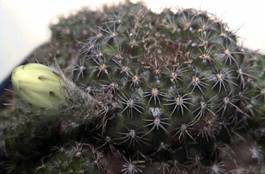 Frailea cataphracta is another normally single headed species, that with age begins to clump and grow oddly. It stays small, and keeps it’s dark brown color. Crests of this species are also available, and have been recent show winners. Frailea grahliana is a common clumping species. It grows quickly, and can easily fill a six inch pot. Frailea pulcherrimia is a representative of a less frequently seen group. These are still small plants, but have finger thick stems that become several inches long, branching freely. The main stem quickly starts to sprawl under the weight of the additional stems. It is a dull green, with short brown and yellow spines. Frailea schilinzkyana remains solitary, and depressed globular (wider than taller). It stays a medium dark brownish green, with short tan spines.